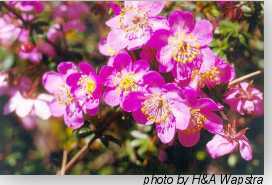 5 or 6 petals on slender stalks, pink or white. Stamens very numerous with long filaments. Wiry shrub with long spreading branches. Abundant from subalpine woodland downwards wherever sufficient light and moisture are available. In areas of high rainfall on the west coast can grow to 6m high growing with and over other shrubs. Grown readily from seed which gives best results when sown fresh. Give seed a light covering and sow at 20-25oC. Capillary watering may be useful due to the fine seed.